Morgan Gusby with Miriam Bienstock, widow of Freddy Bienstock. She is also the only surviving founder of Atlantic Records. 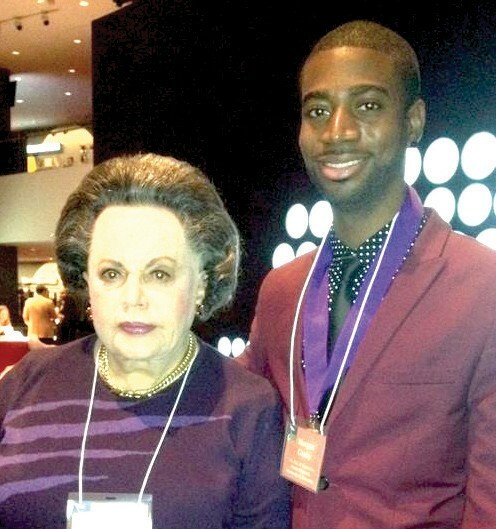 Savannah native, Morgan Gusby, a graduate student at New York University has been named the 2012 recipient of The ASCAP (American Society of Composers, Authors and Publishers) Foundation Freddy Bienstock Scholarship & Internship. The scholarship and internship honors the memory of publishing great, Freddy Bienstock who dedicated his life to the music industry as a music publishing and record company executive. Bienstock founded Carlin America Music Publishing, under its current name in 1995. Their catalog includes more than 100,000 titles spanning a wide variety of musical genres. The 17TH ASCAP Annual Awards Ceremony took place December 12, 2012 in the Allen Room of the Frederick P. Rose Hall, Home of Jazz at Lincoln Center, Broadway at 60th Street in New York City. Gusby, who is the son of WSAV News Anchor, Kim Gusby, received a tuitionbased cash award and a fulltime summer internship at Carlin America. Gusby has also accepted an internship with Sony Music Entertainment that begins January 14, 2013.